I go through phases where I keep a journal and write in it every day. And then I miss a few days and the more I fall behind the less motivated I am to write. From June 2001 to November 2003, my life is very well documented including the weather for that day and the clothes that I wore. The last entry in each book (there are 4 from that time period) is my favorite – it includes a summary of the time covered in that book including everywhere that I traveled (I was traveling about 3 times a month back then mostly for work), my thoughts on my life and the direction it was headed. I wanted to journal when I was pregnant with Juliana but it didn’t work out. Same with the boys – I had so much I thought I should be saying about what was happening and how a new baby (babies) would change our family. I started a journal last August and it has a total of 4 entries – the last one about how incredibly tired I was. We were at the beach having a wonderful family vacation and I was exhausted and miserable –looking back I barely remember being at the beach I felt like I was in a fog the entire time all I wanted to do was sleep and thankfully there were lots of other adults to keep Juliana busy. 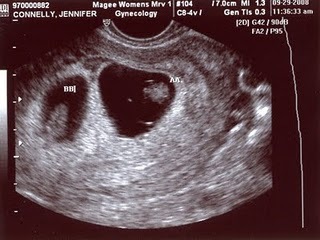 While we were at the beach, we told both sets of parents that we were expecting – I was 6-1/2 weeks pregnant. Since that was the last entry in my journal last year, I have no written account of the next few weeks. One week later I had some bleeding and freaked out. It didn’t help that Scott was scheduled for a 30-day deployment to the other side of the world in just a few days; his orders were canceled before the weekend. On the advice of my Dr. I spent the next few days on bed rest – my mom barely left my side during those days helping me stay calm and try not to worry. The next Monday I called the Drs. Office at 7:00 am and after tracking down my Dr. they sent me for an ultrasound later that morning. I vividly remember everything about that experience – chugging a bottle of water on the drive so my bladder would be full and give us the best possible images (at just 8 weeks, we were going to be looking at a very tiny baby), getting there and waiting, waiting and waiting until I was about to burst, lying on the table holding my breath as the ultrasound tech moved the wand across my belly – praying that we would see a beating heart, and then the image appeared on the screen – two distinct circles. The women’s voice sounded so far away as she said, “here is the first baby and here is the second, I don’t see any more babies, and I see both hearts beating.” I remember looking up at Scott who had a huge grin on his face and was clutching my left hand so tight. Throughout the rest of the ultrasound I tried to process what was happening – two babies? I wasn’t prepared for that news, but I shouldn’t have been so surprised. 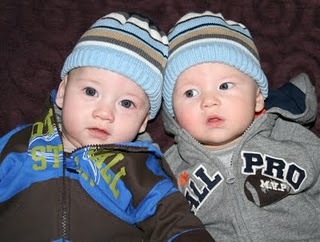 Twins run in my family and in my first pregnancy I was hoping for twins, but not this time – complete shock. We left there with pictures of our tiny babies and called our parents from the parking lot to tell them the news – they were so excited. We went to Panera to get some lunch. As we were walking through the parking lot Scott took my hand and said, “It’s going to be alright.” I replied, “When? In five years? As Scott ate his lunch I picked at a fruit cup in silence trying to rationalize what was happening. I told Scott we needed to stop at Barnes & Noble on the way home to buy a book about twins; reading calms me down. And I started to think about what we needed to do in the coming months. After the first trimester when we started to tell people, everyone would say how wonderful it was that we were having twins. And I was thinking – wonderful? Do you know how much work twins are going to be? Will I ever get a good night’s sleep again? The financial implications? Mother of 3? Two boys? It seemed so odd to me that I was carrying two babies. Even after they were born sometimes I would look at them surprised that there were two. We bought a minivan, changed the bedroom plan for the babies, refinanced our house and gutted the kitchen – all as a result of this news. A lot of work, sleep deprivation – yes and yes. But we also get double snuggles, smiles and giggles, and watching the two of them interact makes me so happy. It’s amazing how much the course of your life can change in a moment and how different our lives are just one year later. Congratulations on one year! I remember the challenges of one newborn, but you had two plus another wee one at home. Major props to you, lady! Oh, double the cuteness! Came here from Burgh Moms to say hello.